As of late, we have seen various manufacturers bringing premium mid-range devices into the market with devices like the Asus Zenfone 2 and Alcatel OneTouch Idol 3 being popular offerings. Now we are going to take a look at the Huawei P8 Lite, which comes with a premium looking build and attractive price, hoping to make a name for itself in this competitive new space. The Huawei P8 Lite follows fresh off the release of the Huawei P8, the company's flagship device. Having only just ventured into the US market, it will be interesting to see if the Huawei P8 Lite has the right ingredients to be a success. The Huawei P8 ad the Huawei P8 Max were announced at around the same time, while the company held back from announcing the P8 Lite at that time. While we would have loved to see Huawei use the same design principles as their flagships, they have chosen to go with a more conservative design with the P8 Lite. While it does share similarities with its more pricey siblings, the all metal construction has been replaced with an all plastic design. However, Huawei has done a great job masking this, giving the P8 Lite a very premium and sturdy feel. A metallic looking (yet plastic band runs around the center of the device, and is sandwiched by two panels. The ports and buttons are located around this metallic band. The left side of the phone is clear, while the right has the power, volume control buttons, microSD slot, and dual SIM slots. On the top you have a 3.5mm universal headphone port and noise cancelling microphone. The bottom of the device has microUSB port, microphone and internal speaker. Its important to note that while it gives the illusion of stereo speakers, the P8 Lite only has a mono speaker. The Huawei P8 Lite features a 5 inch IPS-LCD display with a 720 x 1280 pixel resolution. You also have a layer of Corning's Gorilla Glass 3 protection. The display size and resolution results in a pixel density of 294 ppi, which offers enough detail and sharpness for comfortable use. The display quality itself is far from perfect, sometimes producing less than optimal colors and poor viewing angles. We would have also liked to see better outdoor visibility, as it can get hard to view the screen even with its brightness fully cranked up. The Huawei P8 Lite features a 13 megapixel rear camera and a 5 megapixel front camera. The rear camera is a Sony built sensor which has an f/2.2 aperture lens, BSI, and an LED flash. A shortcut to the camera app is available on the lockscreen for easy access, and Huawei even allows you to quick launch the camera by double pressing the volume down button. The camera interface offers a simple layout, which is easy to navigate through. Users have added functionality like panoramic, HDR, best photo, all-focus, watermark, beauty, and a wide selfie panoramic. The quality of the photos is good generally as long as they are captured outdoors with ample light. Images offer good detail, while we did notice that colors were not captured as accurately as we would have liked. The P8 Lite is also great at capturing macro photos, and its all-focus mode allows you the flexibility of selecting the point of focus after you have captured a photo. The Panoramic Mode on the P8 Lite also works very well under ideal conditions, stitching images together successfully without any issues. We do start facing some issues in lower light conditions. While the smartphone is outfitted with a capable LED flash, the output is not all that great when you don't have ample natural light. In lower light cases, we notice that the photos had less detail, and the output was blurry or grainy. The Huawei P8 Lite captures high definition video at 1080p, but the quality of the outcome is not as good as its image capture. While we didn't expect optical image stabilization with this device, we found the output extremely jittery and over-exposed. For its US release, Huawei has swapped out its Kirin processor with an octa-core Qualcomm Snapdragon 615 processor on the P8 Lite. This chip also includes the Adreno 405 graphics chip and 2GB of RAM. While this setup is usually more than capable of getting you through day to day tasks, you may start noticing a slight lag when during heavier processes. The P8 Lite comes with 16GB of base storage, which is more than sufficient for most smartphone users. One of the dual-SIM slots on the device doubles as a microSD card slot of anyone who wants to increase their storage. The US variant of the Huawei P8 Lite is a GSM device, compatible with both AT&T and T-Mobile bands. In fact, the device is also suitable for traveling domestically and abroad, the only issue that comes to play is its lack of support for the CDMA bands. This means Sprint and Verizon customers are out of luck. Regardless, it’s outfitted with the usual set of connectivity features consisting of aGPS, Bluetooth 4.0 with EDR, and 802.11 b/g/n Wi-Fi. Huawei chosen to leave out NFC on the P8 Lite which is also disappointing. We really enjoyed the audio quality of calls on the Huawei P8 Lite. The voice was clear on both ends and the ear piece was able to clearly pick up the audio even in noisy conditions. The Huawei P8 Lite comes with an non-removable 2200mAh battery, which is not the biggest we have seen in devices of its caliber. The battery can comfortably take you through a day on a single charge, but tends to struggle with heavy use. On the other hand, the handset performed very well in standby lasting nearly a week when left idle. However we did note that this was not consistent, with the battery life varying based on different usage scenarios. 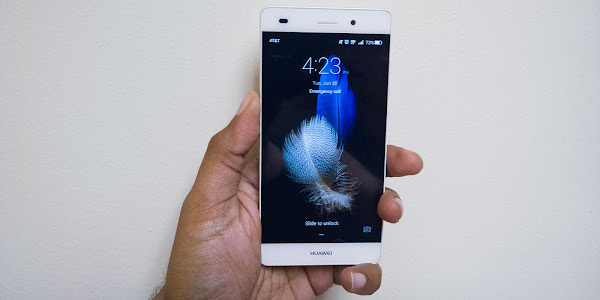 Even though the processor is meant to support rapid charging, the Huawei P8 Lite does not. The handset takes a little over 2 hours to be fully charged. While the Huawei P8 and the Huawei P8 Max were launched with Android 5.0 Lollipop, Huawei chose to offer the P8 Lite with an older Android 4.4.4 KitKat. Still the underlying Android version is fairly unrecognizable with Huawei's version of Emotion UI (EMUI) 3.1 on top. Huawei has chosen to eliminate the traditional Android app panel with EMUI 3.1, though users can re-enable it by adding a new launcher. The lack of the app panel gives the P8 Lite an iPhone like feel with all app icons placed on the various homescreens and the ability to stack them into folders for organization. The result makes Android very usable for those who are new to the platform. However, we dont think this will appease the power users. Added customization is provided in the form of downloadable themes. Huawei has also included a whole slew of their own apps in the P8 Lite, some of which enhance the user's experience while others just add to the clutter. Inclusion of their own custom web browser alongside a pre-installed Google Chrome just seems redundant on a device where the base storage is so low. One thing we didn't like about the custom UI is the multitasking which stacks and displays four opened apps together in a grid. While this would have been usable on smaller displays, we would have much rather preferred Huawei employ a more stock like multitasking on the P8 Lite instead. Huawei has been working hard to make a name for itself in the US market over the years, with its line of entry to mid-level smartphones. The Huawei P8 Lite hopes to take the company's vision one step further, offering a near premium experience at an affordable price. With its $249.99 price, the mid-range Android smartphone is a great choice for new users with an attractive easy to learn interface and access to content from Google Play. Unfortunately it faces heavy competition in its price range, with some of its competitors offering beefier specs and thus adding more value to their offerings.